There are a number of advantages to pondless waterfalls. A full size pond requires significant expense to install and must be regularly maintained, which is a turn off for many people who either don’t have the time to maintain it or the funds for installation. 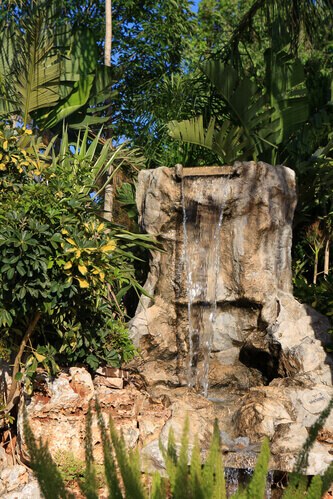 A waterfall without a pond is the perfect solution for these individuals, as it offers all the benefits of a traditional pond without the expense and hassle. This type of waterfall functions by recirculating the water and stream without the need of a pond. Owners get to enjoy both the sound and sight of the moving water without having to worry about the maintenance requirements which would be needed for a complete pond. These waterfalls are also more versatile in the sense that they can be installed both indoors and outdoors, and require far less space than is necessary for a traditional pond. Many enthusiasts would agree that the waterfall is often a focal point in both ponds and water gardens. The presence and sound of moving water is wonderful to behold and has been linked to a number of benefits, both physical and psychological. This is why you will often see waterfalls in hospitals, therapy offices and spa centers, as they are associated with vitality, rejuvenation and good health. Due to the fact that a growing number of people are moving to or live in urban areas, demand has increased for water not only for drinking, cleaning and bathing, but also for aesthetic purposes. How Do These Waterfalls Work? They are similar to standard waterfalls, but will operate by moving cascading water into a hole that is filled with either gravel and or deep rock. Here the water will collect and will then be transmitted upward through a pump to the top, where the cycle will begin again. Since no pool of water is present, these waterfalls are ideal for people who are worried about safety, space requirements or frequent maintenance. They are great for offices and hospitals, particularly in the lobby where they can greet visitors as they enter or wait for appointments. These types of waterfalls are also stylish and come in endless varieties. There is a wide selection of rocks and gravel you can choose and there are an infinite number of ways in which they can be arranged. The cost for installing one is much lower than what you can expect for a full sized pond, and its smaller size means it can be placed anywhere within a yard, home or commercial building. Its maintenance requirements are few and simple to perform. At most the reservoir would need to be filled once every few week which is necessary to make up for the water loss which would result from evaporation. In some cases these waterfalls can also be combined with harvest systems for rainwater. For those who are looking for an aquatic design which is cost effective and low maintenance, a waterfall without a pond is the best solution available.